Wondering what we have been up too? - Arma 3 Server. It's been a long time since I've said anything, but I've finally gotten around to updating the website. We have recently launched our first Arma 3 server! Currently we are hosting a version of Altis Life, with no white-listing. I understand that this can be shocking at first, but rest assured on a server the size of ours, the police will be the least of your problems. Some other things we are up too:. Developing the Altis Life mission (We have many updates and improvements in the pipeline). Developing our Mil Sim missions. Thanks for visiting our website, and we hope to see you again soon. 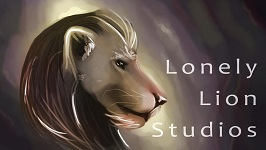 Welcome to the new Lonely Lion Studios, LLC website. This site is a work in progress and will be updated soon to provide more information about us, and our projects. Please be sure to check out our Facebook, and Twitter! ©️ Lonely Lion Studios, LLC. Awesome Inc. theme. Powered by Blogger.